Sentosa is a popular island resort in Singapore, visited by some twenty million people a year. Attractions include a 2 km (1.2 mi) long sheltered beach, Fort Siloso, two golf courses, the Merlion, 14 hotels, and the Resorts World Sentosa, featuring the theme park Universal Studios Singapore. Hard Rock Hotel Singapore At Hard Rock Hotel in Singapore, you will not only have the chance to visit great attractions such as the Universal Studios Singapore, S.E.A Aquarium and the Asia’s flagship of ESPA, but also have a chance to relax and unwind in 5-star accommodations and entertainment joints. 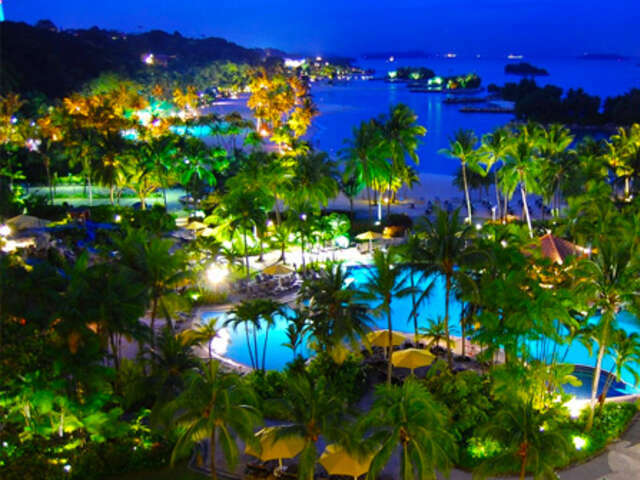 Sentosa: The Island Jewel of Singapore See why this island in Singapore sees over 5 million visitors a year. Singapore Tourism is Sizzling - Have You Been Yet? Singapore is a city on the move and quickly becoming a tourism powerhouse. The city itself might be small but, it provides a traveller with experiences not found anywhere else on Earth. Voyage to the Bottom of the Sea on a Singapore Sentosa Island Trip Looking for a family-friendly adventure? Then check out the Singapore Sentosa Island Afternoon Trip. On this trip visitors will travel to the island by cable car, see pink dolphins in the Dolphin Lagoon and visit the Underwater World Aquarium. Settle in a Reminiscence of Singapore’s Past at The Sultan If you want to have a closer look at Singapore’s rich heritage and culture, then a night or two at a tasteful hotel along Jalan Sultan is recommended.